Janesville and its smaller satellite city of Beloit are located about 15 miles apart in extreme south-central Wisconsin, with Beloit abutting the Illinois border. Both are small industrial towns with a large General Motors plant in Janesville and a variety of businesses, notably food processing and distribution, in Beloit. The GM plant is tied to pickup truck and SUV products. Predictably, the strong auto industry ties give the area a cyclical economy overall. The area was once home to Parker Pen but that business was absorbed by Gillette and the plant was closed. The downtown areas are pretty much the clean small townscapes we’re used to seeing in Wisconsin. The somewhat more “hip” Beloit is home to Beloit College, a well-acclaimed small college, as well as historic districts and a few minor cultural assets. The area is about 100 miles north of Chicago giving access to that city’s vast resources. Cost of living is reasonable for the region. Both towns are located in the broad, fertile agricultural valley of the Rock River. The continental climate is characterized by hot summers and cold winters. Depending on the wind, Lake Michigan may influence the climate. Summers are warm and humid with occasional hot, muggy spells and frequent afternoon thunderstorms. Winters are generally cold with most precipitation falling as snow and remaining as snow cover. First freeze is mid-October, last is late April. The median home price in Beloit is $89,500. Browse Homes in this Range. 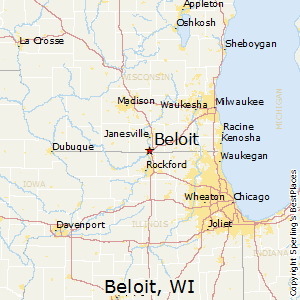 Compare Beloit, Wisconsin to any other place in the USA.